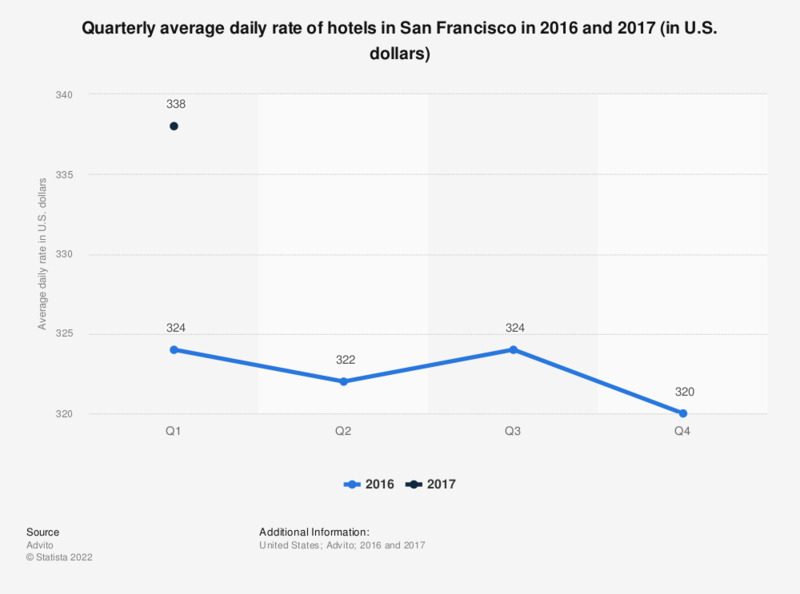 This statistic shows the quarterly average daily rate of hotels in San Francisco in 2016 and 2017. In the first quarter of 2017, the average daily rate of hotels in San Francisco in the United States was 338 U.S. dollars. San Francisco is located in northern California on the west coast of the United States and is the second most densely populated city in the country after New York City. The highest average daily hotel rates in San Francisco was seen in the first quarter of 2017 at 338 U.S. dollars. This represented an increase in average daily rate of around 14 U.S. dollars compared to the same quarter in the previous year. In 2016, 3.93 million people from overseas visited San Francisco, spending 5.9 billion U.S. dollars there. The city is also popular with U.S. travelers who ranked the destination fifth on a list of domestic cities they would most like to visit – perennial favorites are Las Vegas and New York. It is not, however, always cheap to stay in San Francisco. For business travelers, it was the second most expensive destination in the U.S. with an average cost per day of more than 530 U.S. dollars in 2016. As of May 2013, San Francisco was one of the top U.S. cities associated with food tourism. It is also home to two of the most visited tourist attractions worldwide: Golden Gate Park and Pier 39. According to 95 percent of locals, people are very welcoming to tourists there.